I Stepped On A Nail And It Went Through My Flip Flop. This whole week has been like stepping on nails and misspelling words. (Note: I just misspelled the word “misspelling”. Exactly.) It’s been the kind of week filled with sadnosity and the quasi-suicidal-ness that only comes with being over dramatic. Today for instance, I didn’t realize my pants were inside out until someone at the grocery store asked if I was really a size 7. I wanted to ask why they were reading my pants, but I’m nice so I said yes, and then proceeded to discuss the price of chicken for what felt like an hour. Then yesterday, I had a “First Blood”-esque fight/manhunt with a spider that might literally have been the size of Sylvester Stallone. I hid in a corner for 30 minutes armed with a fly swatter and piece of cardboard that I made into a shield. Eventually, [my boyfriend] just came over and hit it with his shoe and then asked me to clean up the fort I made out of sheets and boxes because it was blocking his office area. I reluctantly said yes, but Vietnam changes a man. That spider could have pursued me for weeks. Then I found out that my ex boyfriend/first love got his girlfriend pregnant and I totally freaked. I realize I have no right to be upset, but we were gonna have a baby too and I lost it. (Pity me and I’ll stab you. Don’t make this blog sad.) Mostly, I’m pissed that everyone I’ve ever loved or been best friends with has replaced me with a fat and less-attractive redhead. Seriously, even my best friend all through middle school and high school dropped me for another redhead who was just a poop version of me. So all in all, the nail-in-the-flip-flop-thing wasn’t so bad. Things could always be worse, like being hunted by a large spider or wearing inside-out pants to church. 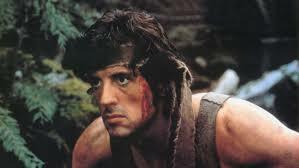 Love your posts especially Rambo with the nail in his flip flop …I thought that should make it into the next Rambo movie…..haahahah….. Solidarity!!! I wore a shirt backwards all day before finally glancing in a mirror. Spent the whole day tugging at the neckline wondering why the dam thing felt so uncomfortable. Wearing things the wrong way is a profession of mine. And nail? Never stepped on one of those, but have stepped on a bee once. I don’t know. I think getting a nail in your foot and having to get a tetanus shot might be just as bad. We’ll call it a draw…for now. “Flip flip” is not hyphenated and English CAN be annoying. Sorry about the rest. Previous Previous post: If You Give Heroin To Your Kitten, You Just Might Be The Worst Person Ever. Next Next post: Destroying My Mother’s Home, Getting The Cats High, And Giving Myself Arsenic Poisoning All In Less Than 48 Hours.